Another great release from the Error!Lo-Fi Records (Spain). Pequeña Fiera! is a band that explores the border between lo-fi and experimental/art rock (vide Radiohead, Sigur Ros, etc.). What we got on Secrets with no words are 5 very dreamy and hazy tunes that take us somewhere very much behind the rainbow. If the band thought about the compositions a little bit thoroughly than it would definitely be a minor underground hit-band. It is still above average, because Pequeña Fiera! is not afraid to try something new (ok, we’ve heard this dream pop/post rock thing before, but still it’s not that everyone plays that way). My favorite track here is do re mi fa sol I kiss you, very chilled-out track with slow, mellow vocals and slacky/lazy melody strolling through out. Generally, it is a band and an album to recommend, and I would gladly check out what more they have in stock. 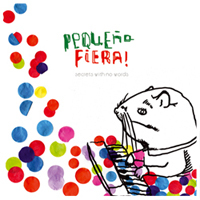 Secrets with not words is the continuation of previous masterpiece ” Not words EP” by Pequeña FIera. 5 songs in the same line that the previous one. Experimental and magical. Every second you listen is a little dream. The perfect connection with the different musical “toys”, and his voice fly with other sounds as a instrument. This EP together with the previous one, they will be edited in CD version under the name of “Singin with not words” (Error! Lo-Fi Recordings 2007).